TRANQUIL VIEW OF PONDS & WOODLANDS FROM ALL EAST FACING WINDOWS! Enjoy the beauty of this panoramic view of water from the wall of windows in the great room, hearth room, kitchen window, and bayed breakfast nook! You'll also be able to take advantage of the views from the MASTER SUITE as well as the FULL, FINISHED WALK-OUT BASEMENT! This exquisite, light-filled home offers a floor plan that defines graceful living! OAK HARDWOOD FLOORS are carried throughout most of the main level, the pillared dining room is open to the great room which features volume ceilings & an impressive granite faced fireplace flanked by pillars. This 2-way fireplace doubles for a Hearth Room in the kitchen making preparing meals a pleasure! This fabulous kitchen offers solid surface counters, plentiful cabinets, large island, an adjacent eating area surrounded by windows and a sliding door that opens to the wrap around deck & stairs to lower level. 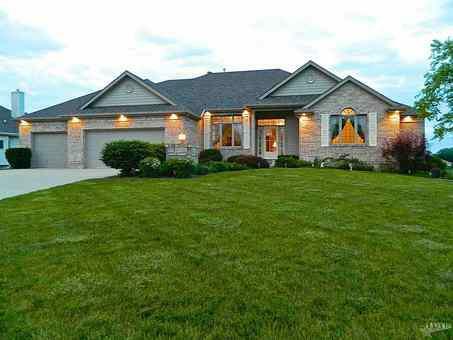 This home offers 5 Bedrooms (5th bedroom currently used as office on main level)…unbelievable storage and space! Dura-Ceramic Flooring - warmer & more durable than ceramic - on lower level offering 2 large bedrooms and a full bath, wired for Surround Sound in the TV room…the list goes on!! This is not a drive-by—make your appointment today to see this home…award winning schools, shopping, entertainment & eateries nearby.